What this weekend’s Bay Area Book Festival says about Berkeley. 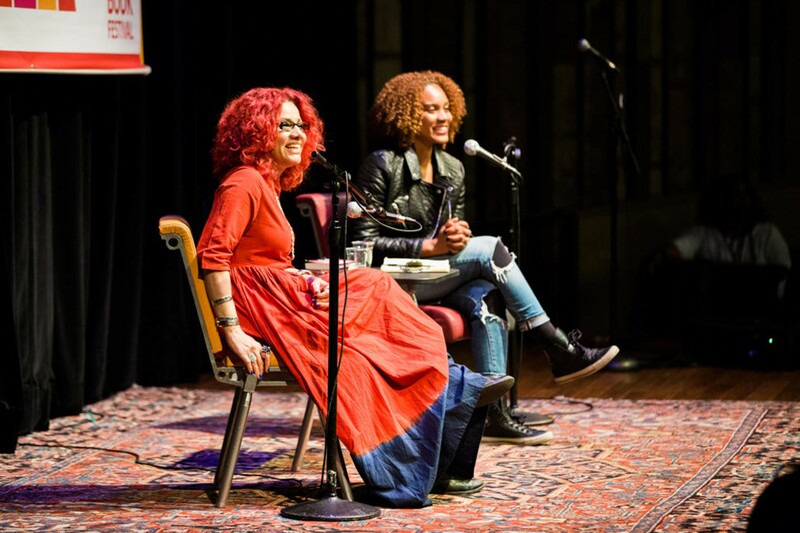 Mona Eltahawy and Chinaka Hodge at the 2016 Bay Area Book Festival. Parsons was in the deep planning stages of the third-annual Bay Area Book Festival, which she founded. “My next thought was, ‘Wait a minute, it’s more relevant now than ever,’” she told the Express. Keeping that in mind, the focus of this year’s festival, which goes down this weekend, is “literary activism.” Author Susan Griffin, who will speak, describes reading itself as a radical act. “Literature takes you to a deeper level of yourself and, even if it’s a wild fantasy, it actually enables your capacity to know things, and enables your trust in your own perception, and enables you to see reality better,” she explained. In a world with ever-increasing ideological division, what we read is a political statement. This year, the festival’s organizers sought out writers with works relevant to current events. “We’re activists in that we’re choosing books and writers that are really pushing an agenda,” one that Parsons says promotes tolerance and social justice. “Literature is a safe space to go into all these other perspectives and experiences,” she said. But for all the perspectives presented at this weekend’s Bay Area Book Festival, there will be one missing: the conservative (and no, having Arlie Russell Hochschild in attendance does not count). Until then, she is grappling with the same question many of us are facing: How to get people to read across party lines? Saturday and Sunday, June 3-4, $8-15, various locations in downtown Berkeley, BayBookFest.org. Barbara Blaser Didn't Try Cannabis Until Her Seventies. Now, She's A Registered Nurse At An Oakland Dispensary.